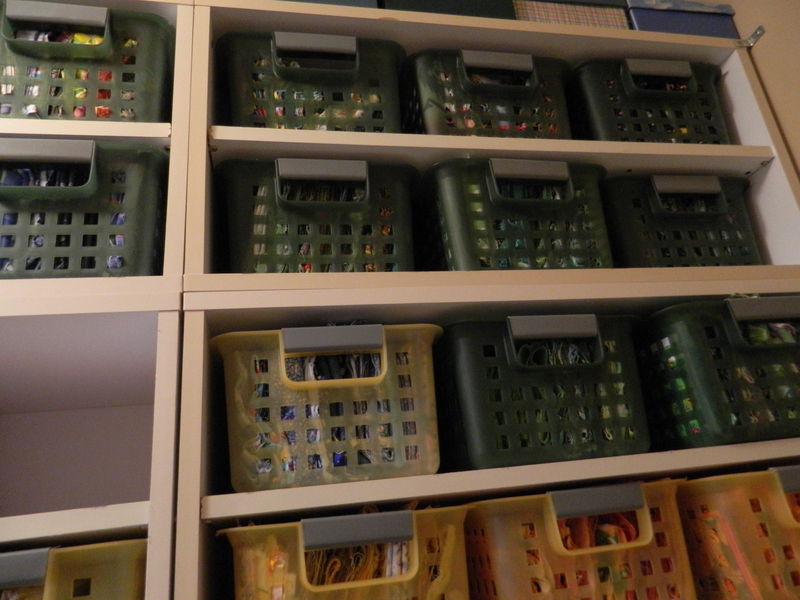 Recently I read a couple a handful of storage methods for quilters and their fabric. There are as many different approaches to how this is handled, as many ideas as there are quilters. Well, I’d like to add my storage plan to the mix. Much as I love the site of fabric, I know that it is not conducive to maintaining colors in fabrics, to allowing your fabric to be exposed to light, especially the rays of the sun. But the plan also needs to keep your fabrics close at hand and easy to get to. Allow you to be able to view your fabrics as a whole while still protecting it. I’ve seen organizing from many different perspectives, such as style, patterns, colors, even sorted by the amount of fabric. Some store fabric in baskets, plastic containers, drawers and on shelves. 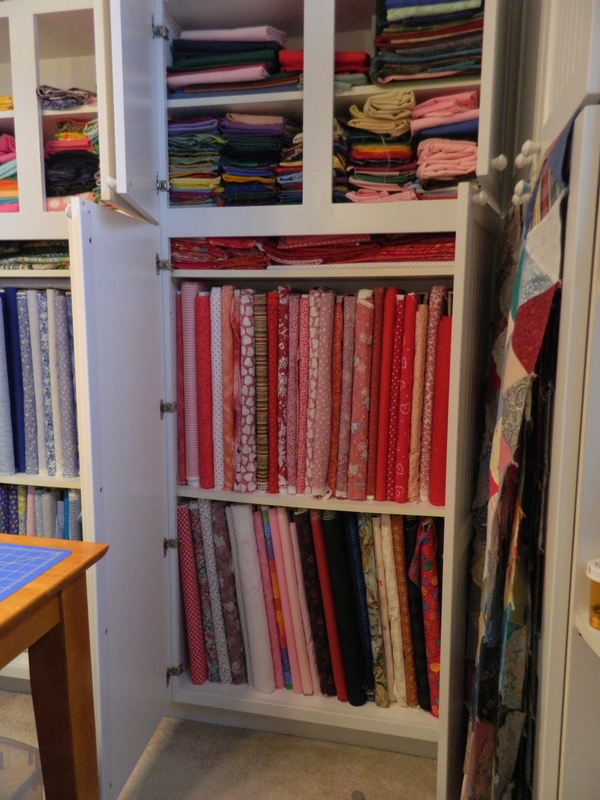 The possibilities are endless and many decisions are based on a number of factors, such as how much fabric is being stored, how much of each fabric, how much money a quilter has to spend and also how quickly the fabric is used. 1. Knows what a ‘fat quarter’ is. Well, folks, that describes me! 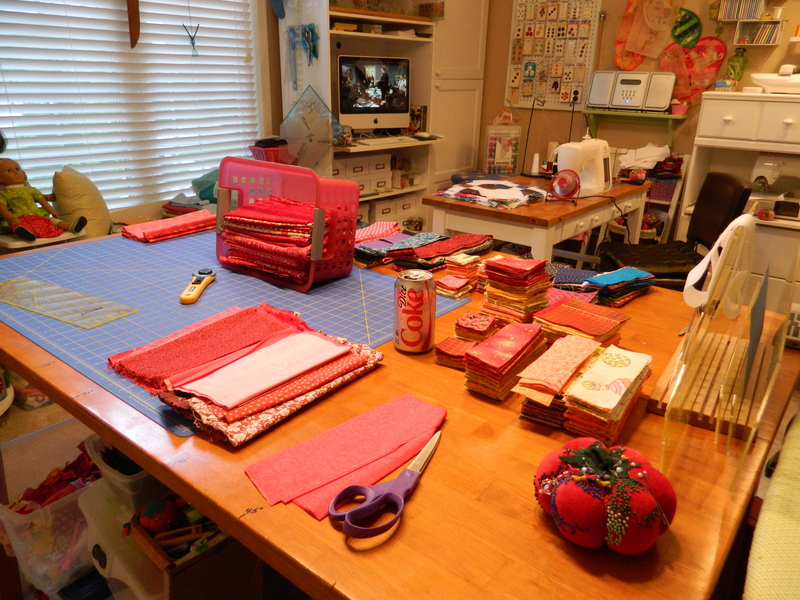 So, let me show you how I handle my “65,000 yards”: My quilting room is actually a converted bedroom. 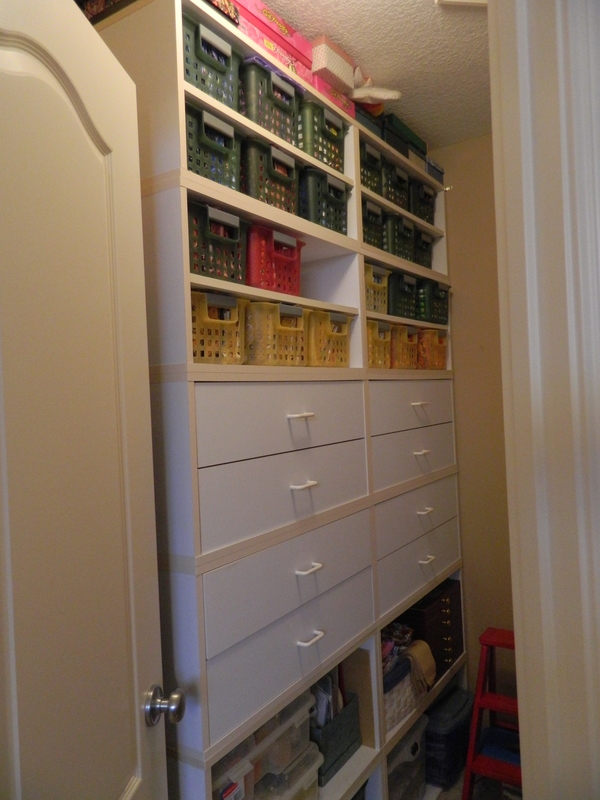 For resale, I didn’t want to eliminate the closet, so I converted it with storage units. 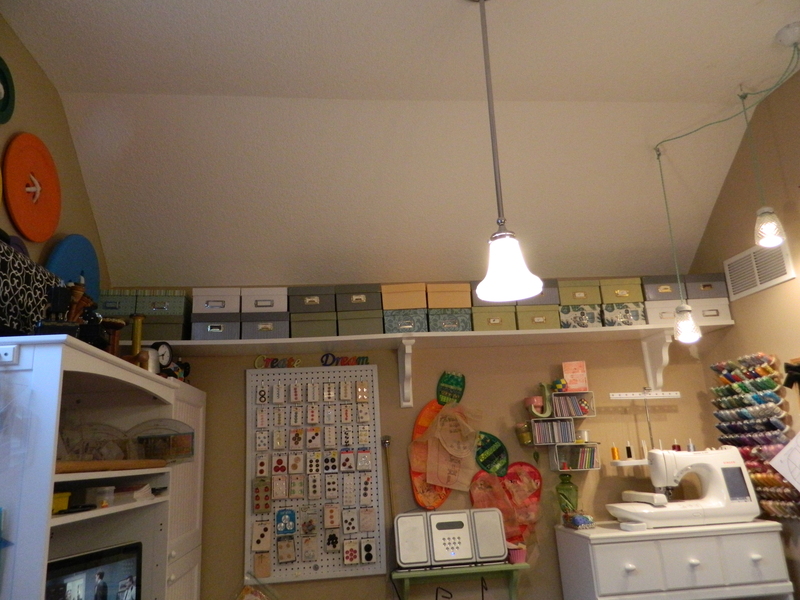 On the left wall, there are both drawer units plus open shelving. I found the baskets and they worked perfectly for this purpose, as they were the right depth as the cabinet and for nine inches of fabric (basically a quarter of a yard). They help reduce the small amount of sunlight and keep things nice and organized. And you can see the color of the fabrics through the holes in the front, which also allow air flow around the material. And above all else, I close the closet door, leaving the fabrics in total darkness. No fading allowed here! The drawers slide in and out quite nicely and I can transport a single basket to the cutting table and back. Here you can see the basket conveniently sitting on the cutting table. I can pull fabrics and cut what I need, then return it to the basket and the basket goes back into the closet. Almost all of the small pieces of fabric are stored here. Any larger size, including fabric still on bolts, go into the extensive cabinetry that I had made and installed when we first built the house. 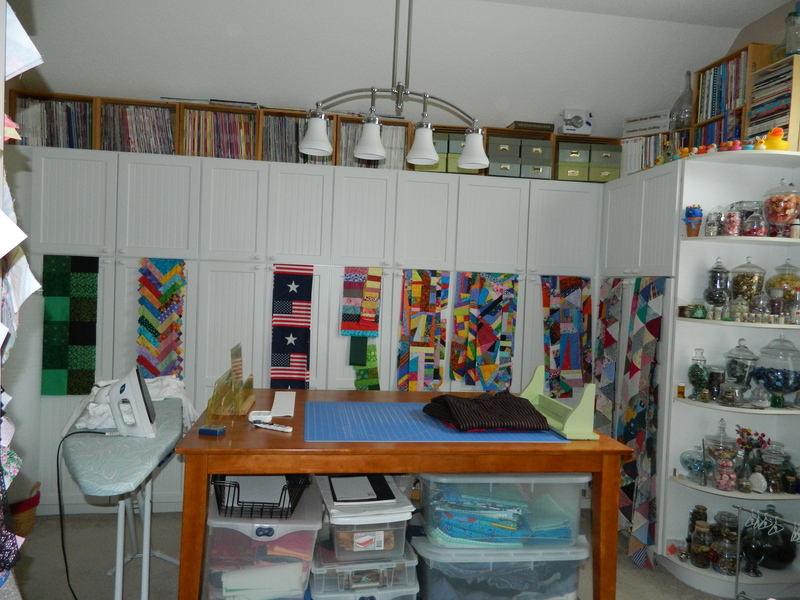 I have, in an earlier post, shown you my wonderful quilting room, but did not share with you what was stored in them. 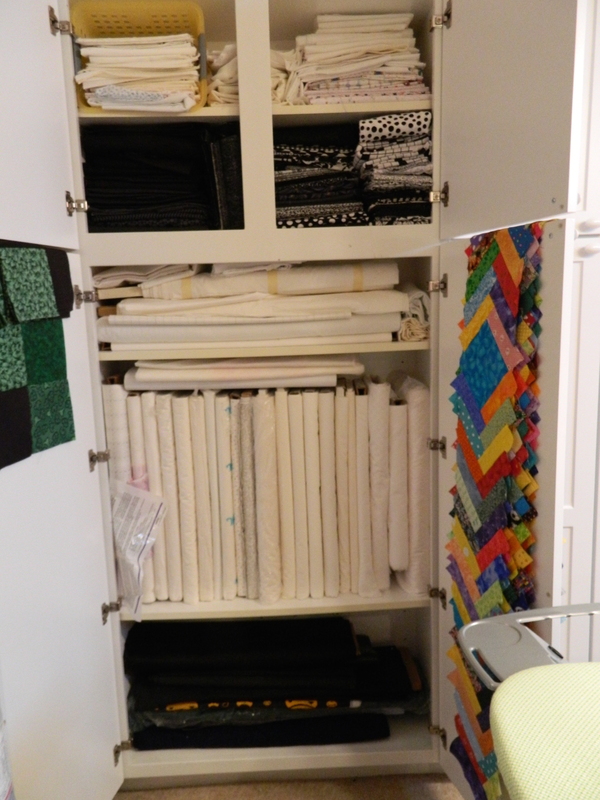 From left to right: The first cabinet is black, white and black & white fabrics. The cabinets, as indicated previously, were custom built to be the exact depth of a bolt of fabric, give or take. I tend to buy fabrics when they are on sale or clearance and keeping it on the bolts, not only keeps the fabric more organized but also cuts down on the creases from folding. 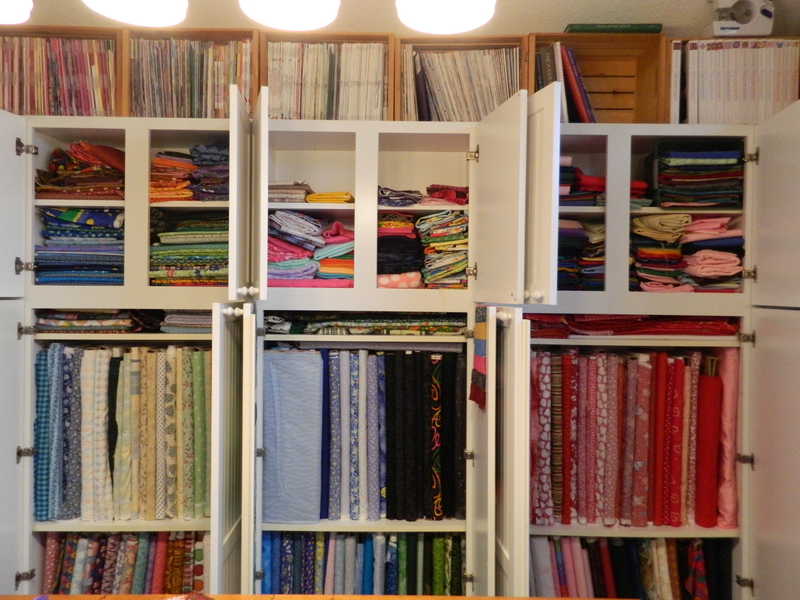 Larger cuts of fabric go on the top shelves. I also moved quite a bit of this when we migrated from California to Missouri and it was so much easier on the bolts. The last cabinet contains most of my solids on the shelf and my reds and pinks on bolts. Isn’t this just wonderful? Sometimes I like to go up and open all the doors and then go through all of the fabric and admire the colors and patterns. And last, but not least, these boxes lined up across the east wall contains pre-cut squares; I most usually use 2″, 3″ 4″, 5″ and 6″. One of my favorite sizes is 2″ x 6″, perfect for the ‘fence rails’ or ‘braided’ patterns. 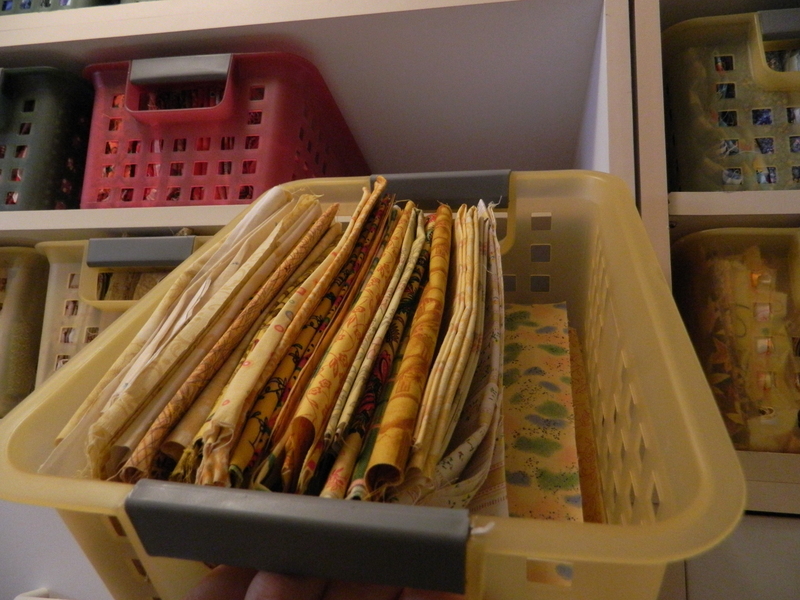 I also store scrappy squares that I complete as I have time and scraps.So, I am interested in how you store your fabric; do you store it by color or size or something else? How much fabric do you have on hand at any one time. Is it more difficult to use up your stash than to buy more? Share your ideas!